In Vedic astrology, Navagraha Yantra, just like Navagraha Mantra, is used to eliminate defects and Doshas located in the horoscope. Along with this, yantras are used to worship goddesses and gods in order to attain auspicious results. These are displayed in a symmetrical frame on a dried bark or bhojpatra, paper or any plain surface during the auspicious time of every planet. These yantras contain immense powers. Some yantra are primary designed with lines, shapes and numbers as well. 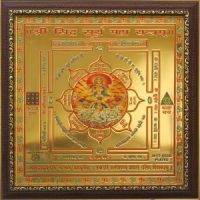 In some cases, beej words are also used; as the Beejakshara (beej word) is claimed to be one whole yantra. An amulet made with Copper. Take a pinch of Ashtagandha, mix some drops of Ganges water and prepare an ink. Now draw a picture of yantras related to specific planets on the pieces of Bhojpatra from the pen made from pomegranate branch and allow it to dry. Now fold the dried picture of yantra and keep in the amulet. You can wear this amulet in yellow or red thread around your neck or right arm. When creating and wearing this yantra, you must chant the spell of the planet concerned. 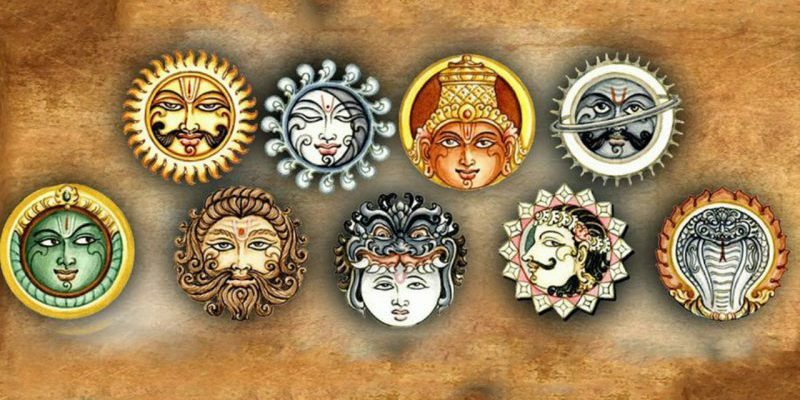 Importance & Benefits of Navagraha Yantra: According to Vedic Astrology, planets and their positions in an individual’s horoscope majorly determine his luck factor and fortune. Navagraha Yantra proves to be the perfect remedy to get rid of malefic effects of these planets. Navagraha Yantra eliminates the malefic effects of turbulent planets. Establishing this yantra brings happiness, prosperity and prosperity in life. This device decreases the adverse effects of planets and increases their favorable effects. How to Set Up Navagraha Yantra: Navagraha puja is carried out through Navagraha Yantra. This yantra can be set up as per the auspicious timing but will be highly effective if done around the time of Navratri. Take a proper bath, arrange a seat and put Navagraha Yantra on it. Sprinkle Panchamrit on it and offer flowers. After the puja, chant Navagraha Mantras. Then, keep the yantra in puja house and worship regularly. Importance & Benefits of Surya Yantra: Sun holds a major importance in Vedic Astrology. Surya Dosh gets eliminated from a native’s horoscope if Surya Yantra is ritually established. It not only provides positive energy, but incurs patience, philosophical power and strong eyesight. It also aids in removing diseases and mental stress from one’s life. Apart from this, if the person has aimed to get a government job, setting up this yantra will do wonders for him/her. How to Set Up Surya Yantra: In order to reap benefits, rules must be followed when establishing Surya Yantra. Set this yantra in Sunday Hora or Sun Nakshatra on Sunday. Any individual who is responsible of establishing this yantra must bathe before sunrise, meditate and purify the yantra with gangajal and cow’s milk. Then, lay a yellow-colored cloth facing towards the east direction and then keep the yantra on it. Now apply sandalwood paste on four corners and center of the Sun. Also, keep saffron and red-colored flowers and chant “ॐ ह्रां ह्रीं ह्रौं सः सूर्याय नमः / oṃ hrāṃ hrīṃ hrauṃ saḥ sūryāya namaḥ” while worshiping the device. Importance & Benefits of Chandra Yantra: This yantra is installed in order to please Moon planet. Chandra Yantra is worshipped in order to attain Lord Shiva’s blessings and grace. Keeping this yantra in front of you and worshipping eliminates every kind of fear and provides a better health. Apart from this, you get success in business and job. Whoever gets blessed by this yantra is entitled to gain recognition in society and s/he doesn’t have to face any kind of obstacle or mental stress. How to Set Up Chandra Yantra: In order to gain benefic effects of Chandra Yantra, establish it on any Monday of Shukla Paksha at the time of Chandra Hora or Chandra Nakshatra. Carry out Panchopchar puja and offer Kheer (sweetened rice in milk and nuts) or any white-colored sweet and white flowers. Use Sphatik Mala to chant the mantra, “ॐ श्रां श्रीं श्रौं सः चंद्रमसे नमः / oṃ śrāṃ śrīṃ śrauṃ saḥ caṃdramase namaḥ“. 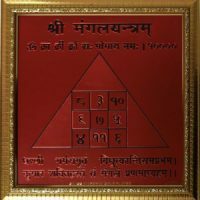 Importance & Benefits of Mangal Yantra: If you want to succeed in your task, Mangal Yantra is known to be very effective. By worshipping this yantra, doshas related to Mars or Mangal planet can be removed and wishes of natives come true. If there is any problem related to politics, domestic life, job placement etc. then you must worship Mangal Yantra. This will remove all your troubles. With the auspicious effect of the Mangal Yantra, courage and physical strength in one’s body increases. 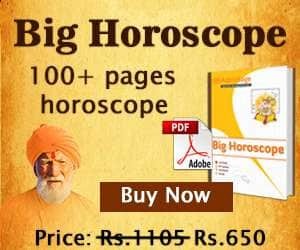 How to Set Up Mangal Yantra: Mangal Yantra must be established on Tuesday during Mangal Hora and Mangal Nakshatra. After bathing, Mangal Yantra must be kept in front and beej mantra must be chanted 21 times “ॐ क्रां क्रीं क्रौं सः भौमाय नमः / oṃ krāṃ krīṃ krauṃ saḥ bhaumāya namaḥ“. Now sprinkle ganga water or raw cow milk on the yantra and wish for good outcomes. After worshipping, set it down at an auspicious place. 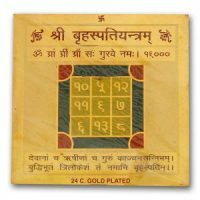 Importance & Benefits of Budh Yantra: According to Astrology, worshipping Budh Yantra results in favorable outcomes such as enhanced intellectual power, impressive speech and communication and success in the fields of mathematics and computers. Apart from this, with the blessings of this yantra, natives doesn’t suffer from skin-related disorders. It is said that Mercury planet directly affects the field of business. 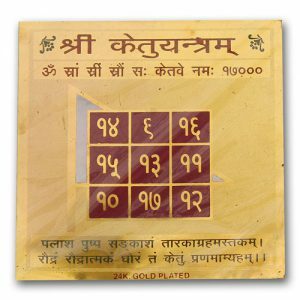 Hence, Budh Yantra is beneficial for entrepreneurs and businessmen. How to Set Up Budh Yantra: Budh Yantra must be established at an auspicious place during Budha Hora and Budh Nakshatra. 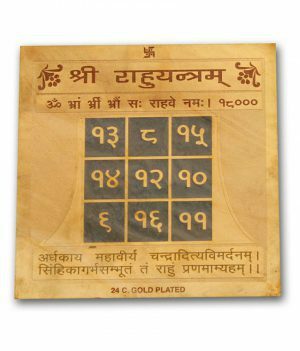 On the day of establishment after bathing, keep this yantra in front nd chant Budh Beej Mantra 11 or 21 times “ॐ ब्रां ब्रीं ब्रौं सः बुधाय नमः / oṃ brāṃ brīṃ brauṃ saḥ budhāya namaḥ”. Now sprinkle some holy Gangajal or raw cow milk on Budh Yantra and wish for good results. Similarly, worship this yantra regularly. Importance & Benefits of Guru Yantra: Brihaspati Yantra is also called as Guru Yantra. 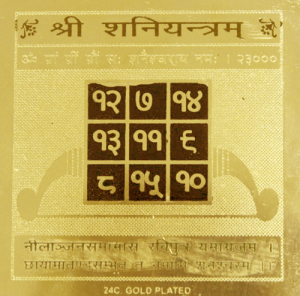 Any native blessed with the effects of Guru Yantra is sure to do well in life. 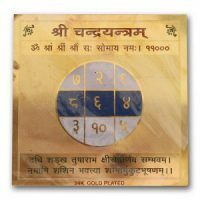 Brihaspati Yantra eliminates obstacles related to higher studies and offer favorable results, financial bliss and spiritual progress. 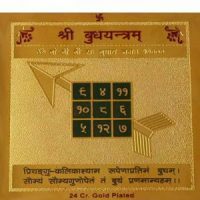 In case any native is facing any kind of problem in marital life, this yantra can help diminish such problems. 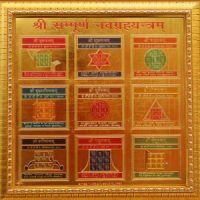 How to Set Up Guru Yantra: Guru Yantra must be published on Thursday during Brihaspati Hora and Brihaspati Nakshatra. Firstly, take a bath and bathe the yantra with Gomutra (cow urine), Ganga water and cow milk. Now place the yantra at the place of worship, light the lamp and carry out panchopchar puja. After this, offer yellow flowers, yellow fruits and yellow dessert. Chant Guru Beej Mantra “ॐ ग्रां ग्रीं ग्रौं सः गुरुवे नमः / oṃ grāṃ grīṃ grauṃ saḥ guruve namaḥ”. Use yellow sandalwood mala when chanting. Importance & Benefits of Shukra Yantra: As per Vedic Astrology, Shukra is a reigning factor for material pleasure, love, marriage, art and desires. If there is a lack of love, marital bliss, worldly pleasures or creativity in one’s life, then that person must worship the Shukra Yantra. It brings opportunities with itself and natives gain profitable results. 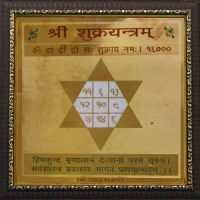 How to Set Up Shukra Yantra: Shukra Yantra must be set up on Friday during Shukra Hora or Shukra Nakshatra. Take a bath before starting the ritual, keep the yantra in front of you and chant the mantra 21 times, “ॐ द्रां द्रीं द्रौं सः शुक्राय नमः / oṃ drāṃ drīṃ drauṃ saḥ śukrāya namaḥ”. Now sprinkle holy Ganges water or raw cow milk on Shukra Yantra. Now wish for blessings and establish it at an auspicious place. Importance & Benefits of Shani Yantra: If you want to be graced with Shani’s blessings, then worship Shani Yantra wholeheartedly. With its effects, natives succeed in attaining their goals. Also, it strengthen your resolution power. Commonly, any movement of Shani isn’t considered to be auspicious, which is why worshiping Shani Yantra is said to be highly effective. Shani moves at a slow pace but its results are solid and steady. How to Set Up Shani Yantra: Shani Yantra should be established on Saturday during Shani Hora and Shani Nakshatra. After bathing, keep the yantra in front of you and chant Shani Beej Mantra 21 times, “ॐ प्रां प्रीं प्रौं सः शनैश्चराय नमः / oṃ prāṃ prīṃ prauṃ saḥ śanaiścarāya namaḥ”. Now sprinkle ganga water or raw cow milk on Shani Yantra, wish for good results from Lord Shani and set it at an auspicious place. Importance & Benefits of Rahu Yantra: In contrast with others, Rahu Yantra is majorly used around. One of the reasons is that Rahu offers negative or mixed results in one’s birth chart. In either of the cases, Gomed gemstone cannot be used to attain beneficial outcomes. Rahu Yantra protects one from various obstacles in academics, business, career, hidden enemies, treachery, secret diseases, public humiliation and difference. How to Set Up Rahu Yantra: Set up Rahu Yantra during Rahu Nakshatra on Wednesday. After the establishment and bathing of this device, keep it in front of you and chant Rahu beej mantra 21 times “ॐ भ्रां भ्रीं भ्रौं सः राहवे नमः / oṃ bhrāṃ bhrīṃ bhrauṃ saḥ rāhave namaḥ“. Now sprinkle ganga water or raw cow milk on Rahu Yantra. Now wish for good results and set it at an auspicious place. Importance & Benefits of Ketu Yantra: Ketu Yantra is worshipped in order to eradicate the effects of mental trauma and untimely accidents. If your mind remains disturbed, then you should worship Ketu yantra. It will be very beneficial for you. People suffer from ill effects of Ketu Planet such as physical pain, injury, skin diseases etc. But if you set up and worship this yantra regularly, you will attain health benefits due to its grace. How to Set Up Ketu Yantra: Ketu yantra must be established during Ketu Nakshatra on Monday. Take a holy bathe before setting it up and chant Ketu Beej Mantra 21 times after keeping the Yantra in front, “ॐ स्रां स्रीं स्रौं सः केतवे नमः / “oṃ srāṃ srīṃ srauṃ saḥ ketave namaḥ”. Sprinkle Gangajal or cow’s raw milk on the yantra. After thant, wish for good outcome and then establish it properly. In Vedic Astrology, you must have understood the significance of Navagrahra Yantra and nine planets. In astrology, worshiping yantras is considered to be very effective in calming down planets. If you want to avail benefits of Navagrahra Yantra, then you should establish the yantra according to the above methods and pray regularly. You will definitely get amazing benefits of these yantras.